Bodrum-Istanbul-Doha-Dubai = a very long night! 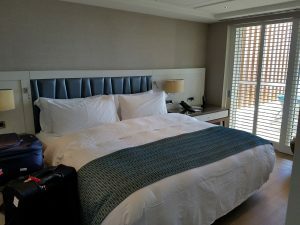 At about 4:30am I got a taxi from my hotel to Bodrum Airport. The ride was about 40 minutes (imagine it during rush hour!) My flight to Istanbul took off at about 7:45am. 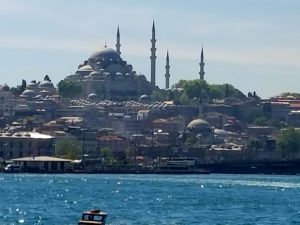 I arrived in Istanbul in about an hour (8:40am). I checked the availability of flights to Qatar. My flight was leaving at 5:30 pm but there was another flight leaving at 2:00pm. 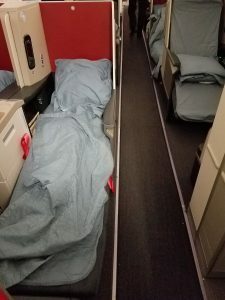 I tried to get on the earlier flight since there was availability but they wanted to charge me a price differential of about $750 (mind you I already had a business class ticket) which I would not pay. But perhaps the worst part is that Qatar Airways will not check you in until 3 hours before the flight (in my case, 2:30pm) which means no access to the business class lounge (which is airside and where I wouldn’t mind killing a couple of hours) and so I had to wait in the general departures hall before security. It was a long wait. 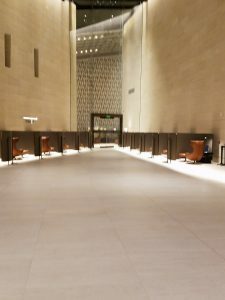 Finally, they opened the gate, I checked in and went to the lounge. 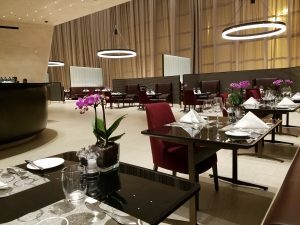 The flight took off at about 5:45pm and we landed in Doha, Qatar at about 10pm. The best part was yet to come, however! 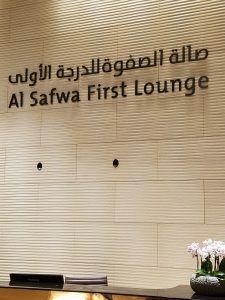 Since Qatar Airways classifies its business class flights within the Middle East as “first class” (mostly for the benefit of the locals, who frequently take these flights between the Gulf countries), I was given access to the new exclusive Al Safwa First Class Lounge at Doha Airport Qatar. 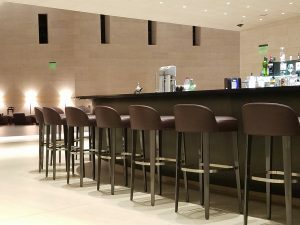 This is probably the holy grail of airport lounges. Its design is modern and its scale and size will leave you speechless. It actually looks like a terminal! 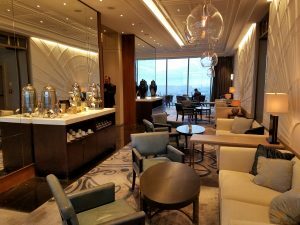 I wouldn’t mind spending a few days in this lounge! 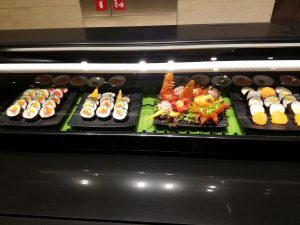 It has a sushi bar and a deli. 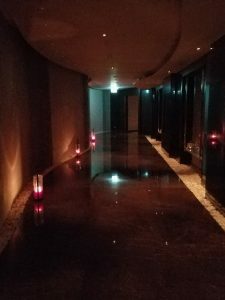 It has an elegant ala carte restaurant with a bar serving any beer, wine, cocktail or champagne imaginable. 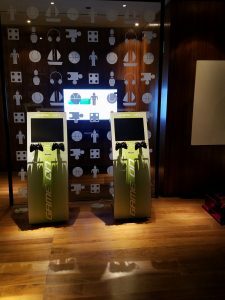 It has a game and play room for kids and a room for their nannies. It has a spa and doctor’s office. 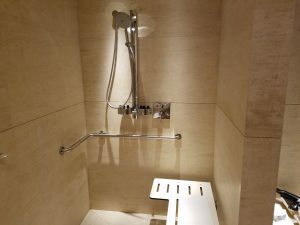 And who needs an airport hotel when you can sleep in a 2 bed quiet room, complete with a shower. 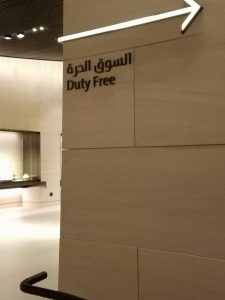 they even have a duty free store in the lounge! All in all it was a great experience! 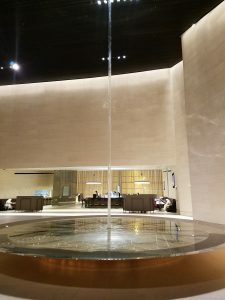 And even though I only spent about 2 hours in the lounge, I knew in 2 weeks I would be able to visit it again on my flight from Dubai back to Qatar. And I was also looking forward to my flight from Qatar to Dubai in a very special aircraft! 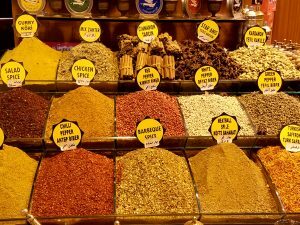 Author gringo10_wpPosted on May 4, 2016 May 5, 2016 Leave a comment on Bodrum-Istanbul-Doha-Dubai = a very long night! 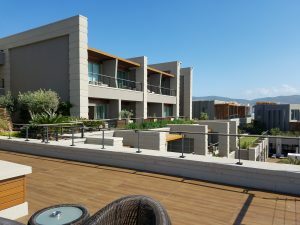 Bodrum, Turkey is only about 20 miles from Kos, Greece. There are frequent ferries running both ways. The trip is about 45 minutes. 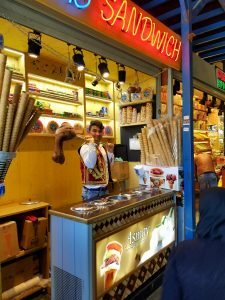 It is fascinating to be able to quickly go from one country to another and hear a different language, use different currency, see different customs and eat different food. 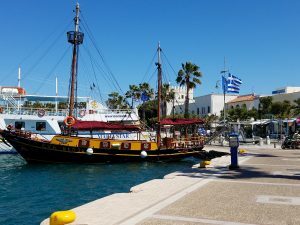 Kos is one of the Dodecanese islands, the largest of which is Rhodes. 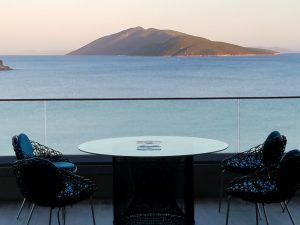 Dodecanese comes from the Greek meaning 12 islands, even though there are 15 of them. 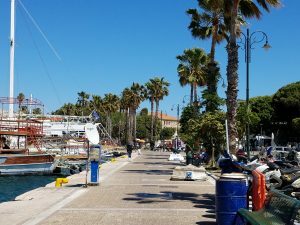 The port of Kos is small but lively, with many beahfront cafes, bars and restaurants and gets really busy in the summer with tourists from England and Germany. There are beautiful beaches. 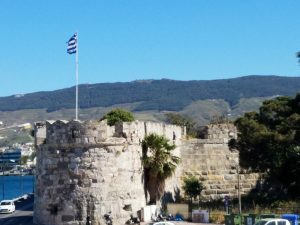 Some of the sites to see are the ancient Greek burial grounds, the Castle of the Knights of St. John (built by the crusaders) and the tree under which Hippocrates taught his students medicine. 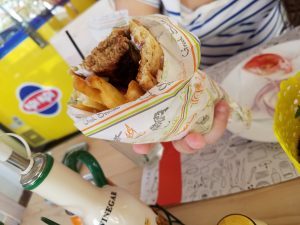 I walked around the port a bit, went into a small, cozy restaurant and had a delicious Greek souvlaki. 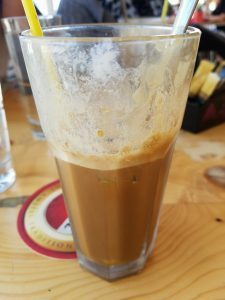 After lunch, I strolled back to the port and had a frappe (iced coffee drink) at a place called G-Cafe. 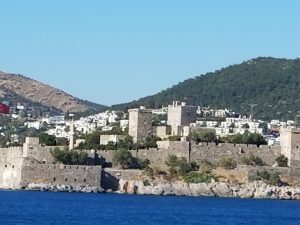 I then walked around the town, took pictures of the castle and other sites, and then took the ferry back to Bodrum, Turkey. 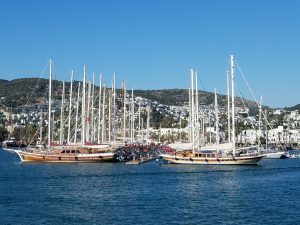 Entering the port of Bodrum, perfectly straight rows of gulets (traditional, Turkish wooden sailing boats) lined the harbor. Guarding the harbor was the Castle of St. Peter, another impressive feat of building by the Knights of St. John. And don’t miss the tomb of Mausolus, a Persian ruler. 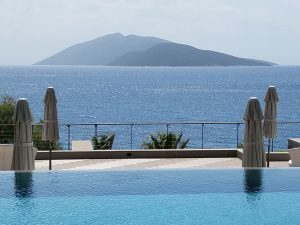 It is near the port of Bodrum and it from where we get the term “mausoleum”. 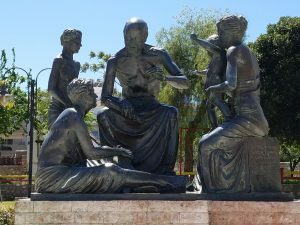 a statue of Hippocrates (a native of Kos) teaching his students medecine. 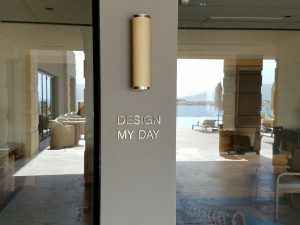 One afternoon, I decided to walk around Bodrum. If I walked right, I would walk into the center of town. If I walked left, to the less developed hill top villages. So naturally I went left. Someone had told me that there was a hidden gem of a tavern in the area, but it was so off the beaten track, that I would never find it. They were right. But persistence prevailed and soon I came upon Bagarasi restaurant. There is no sign and the restaurant is down a side street hidden from the main road. But the negatives stop there. 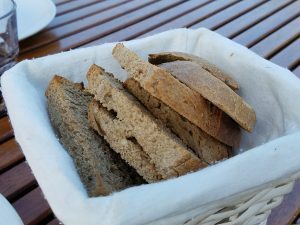 The small tavern is run by Maria (a schoolteacher by day and cook by night) and her family. 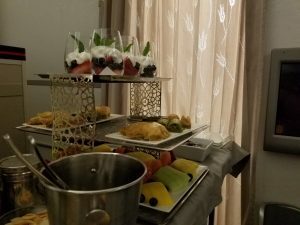 The food is incredible. 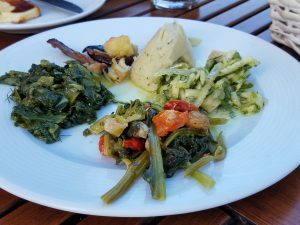 Maria grows all of the greens used as side dishes and mezze (small plate appetizers) as well as all of the herbs used to season her meals, in her garden. 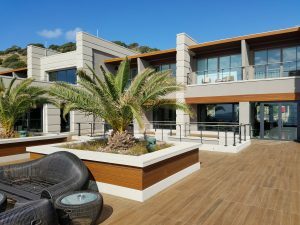 The restaurant is in the front part of her property with her home next to it. 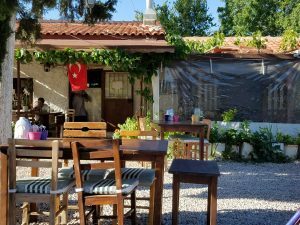 And it is just what you would expect from a hidden hillside tavern-small wooden tables and chairs naturally protected from the sun by overhanging, large, old trees. 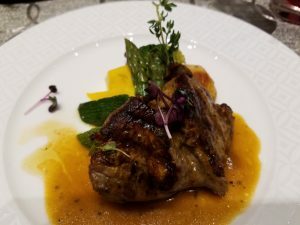 From the fried local goat cheese appetizer to the main courses of fresh fish and kebabs, everything was fresh, perfectly seasoned and delicious. 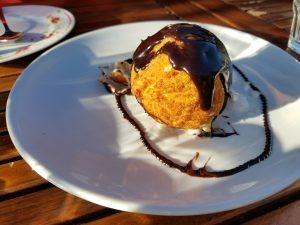 The chocolate soufflé and fried ice cream were as good as any I had ever eaten. 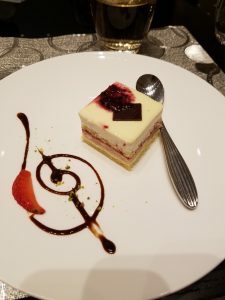 Overall the meal was as good as any five star resturant. So the next time you come to a fork in the road, turn left-you will not regret it! 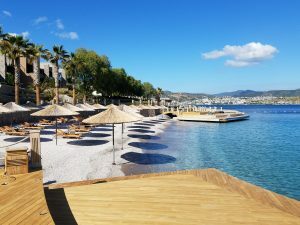 After a few days in Istanbul, I wanted to visit one of the beach areas of Turkey. 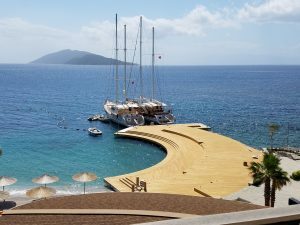 I chose Bodrum which is frequently referred to as the “Turkish Riviera” since many of the wealthy Turks spend weekends and the summer there. Istanbul to Bodrum is like New York to Miami. And the best part is the short 45 minute flight. 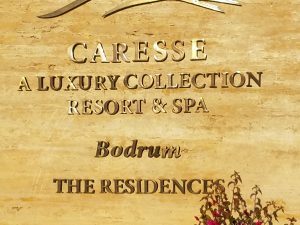 When I arrived in Bodrum, I checked into the Caresse Resort and Spa, which is part of Starwood’s Luxury Collection. It is new and beautiful! 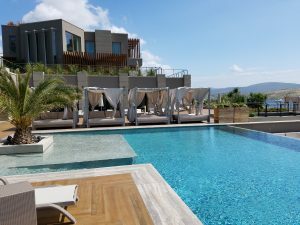 I could tell that this was going to be a great stay in Bodrum! And if you ask me if I can cross the Bosphorus…. 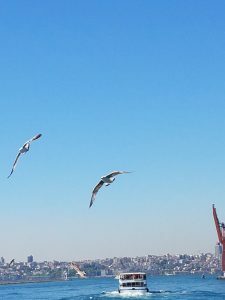 Today I was out and about in Istanbul. I wanted to see some things but not go too crazy, so I planned my strategy carefully. 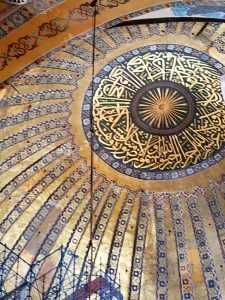 I would take a taxi from my hotel to the Sultanahmet (Old City) area. 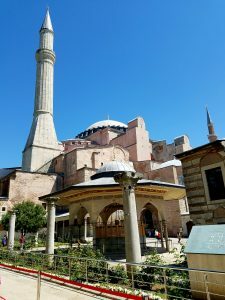 I would then see the Hagia Sophia (the number one thing to see in Istanbul), cross the street to see the Basilica Cisterns, take the trolley for a 5 minute ride to get to the Egyptian Spice Market and then cross the street to catch the public ferry which crosses the Bosphorous waterway to get from Europe to Asia. Not totally ambitious, but enough to see and do some important things and finish at just about the time the terrible Istanbul rush hour begins. 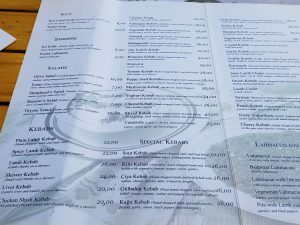 Istanbul is a great value now. Why? Because people are spooked about several explosions in public areas since January. But as the great Warren Buffett says, “When people are scared, be greedy”. Not to downplay the severity of these events, but most were in the capital city of Ankara (several hours away on the Asian side of Turkey) or near the border with Syria. One was near Taksim square in the New City (where I was not going) and one was in the Old City (where I would be going). Then again, no one abandoned New York City after 9/11 or Boston after the marathon bombings, so if you don’t go, they win. 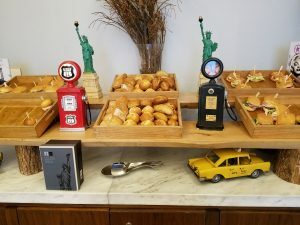 And since many were spooked, the 5* Hilton hotel where I am staying goes for about $100 dollars per night (in a beautiful room which would be well over $500 per night in Manhattan). 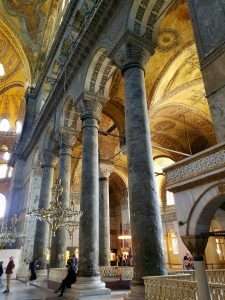 And there was virtually no line to enter the Hagia Sophia, an attraction which generally has a line a quarter mile long. With this in mind, I set out. 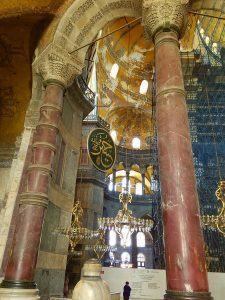 The Hagia Sophia (Church of the Divine Wisdom in English) is one of the world’s great attractions. 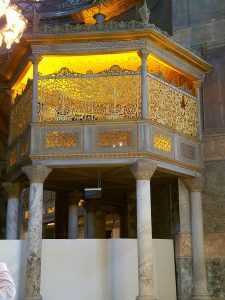 Originally built as a Christian Church, it was converted to a mosque by the Ottomans when they conquered Constantinople (Istanbul) and is now a museum. 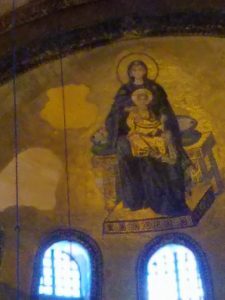 The tile work done by the Ottomans is beautiful as are the paintings of Mary and the Archangels done by the Christians. 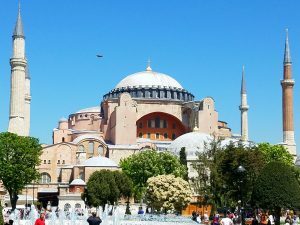 The size of the Hagia Sophia is overpowering. There are two columns brought from the Roman temple to Artemis at Ephesus. And the marble provides a welcome relief from the hot Istanbul sun. 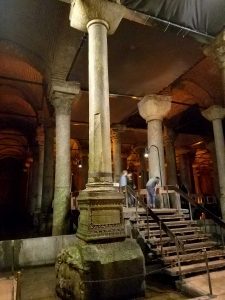 Across the street from the Hagia Sophia are the Basilica Cisterns.These were built and used by the Romans about 1500 years ago to store water. They are underground, dark and mysterious. These also provide a welcome relief from the heat. 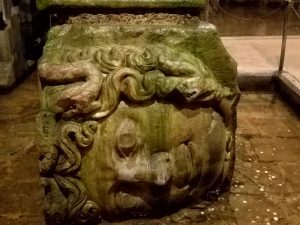 There are upside down Medusa heads on the base of the columns which the Romans believed would protect the cisterns and the city. They are upside down and the eyes are closed so they would not harm any of the good people looking at them. 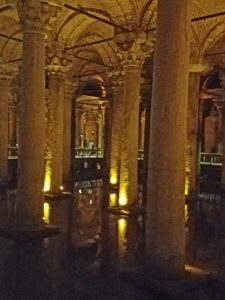 The cisterns were basically abandoned by the Ottomans who preferred running water to stagnant water stored under the ground and they were only restored and reopened a few years ago. Well worth the visit! 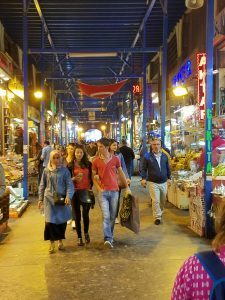 I try to avoid bazaars, so I opted to not visit the Grand Bazaar, which is a labyrinthine maze of shops selling cheap Chinese goods and full of cigarette smoke from the ubiquitous Turkish smokers. 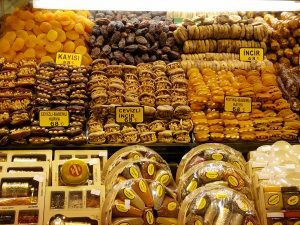 I did however, visit the Egyptian Spice Market, which is a much smaller bazaar selling dried fruit and nuts, spices and the famous Turkish delights sweets (I could not resist!) 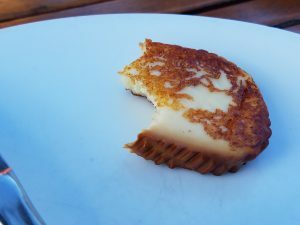 You will be offered so many samples that you will be full, but buy some anyway as the craving comes back real soon! 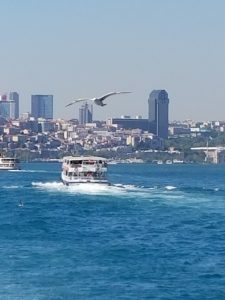 I then took the public ferry to Kadikoy on the Asian side of Istanbul.It was one of the things I had always wanted to do. 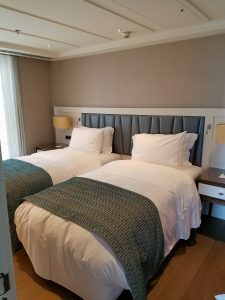 The boat ride is about 20 minutes and has amazing views of the Bosphorus (the waterway between Europe and Asia), the sea of Marmarmis, the Asian side of Istanbul and the Old City on the European side. 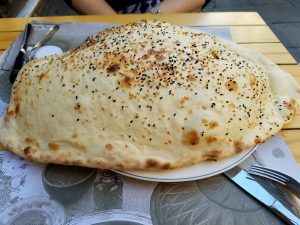 Upon alighting, I walked to the famous Ciya Kebab house where I had mouthwatering lamb Shish Kebab and some of the delicious Turkish bread which comes to you looking like an inflated, small pillow until you pierce it and all of the smoke comes out. 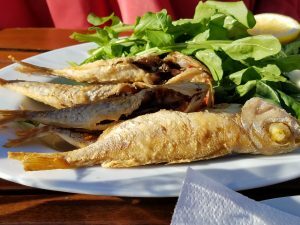 Having eaten, I quickly walked back to the ferry back to the European side and from there it was a short taxi ride back to my hotel before the horrendous Istanbul rush hour began (during which you will literally not move). So if you ask me if I can cross the Bosphorous, I say of course-erous and do! 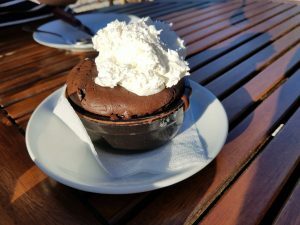 Watching him knead the ice cream made me need it that much more! 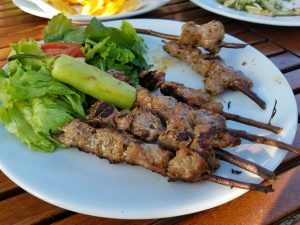 Are these enough kebabs for you? 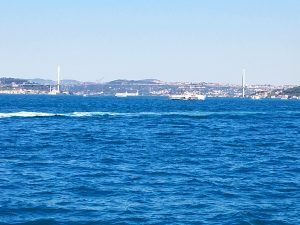 Author gringo10_wpPosted on April 23, 2016 April 24, 2016 Leave a comment on And if you ask me if I can cross the Bosphorus…. 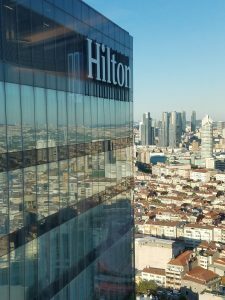 The Hilton Bomonti-a great escape when Istanbul overwhelms you! Istanbul is simply overwhelming. A city which straddles both Europe and Asia and has a population of about 14.2 million (with nearly 10 million living on the European side), its rush hour traffic makes New York City’s look inviting. 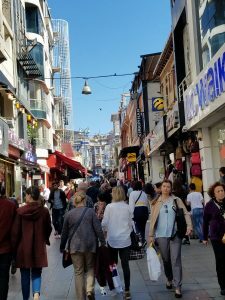 Many of the hotels are in the popular historic areas such as Sultanahmet (old city) or Taksim (new city) but most of the time thec streets of these areas seem like a non-stop flow of humanity. 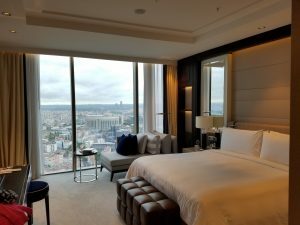 That is the reason that I chose to stay at the Hilton Bomonti-a new five star hotel which caters to business people and conventions. 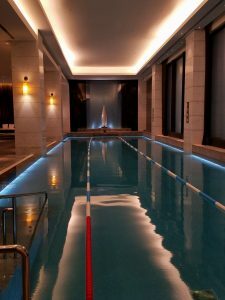 The hotel is located in an upper middle class section of Sisli, an Istanbul neighborhood. A ten minute walk to the metro, you can get to all of the popular parts in the old or new city in about 20 minutes. 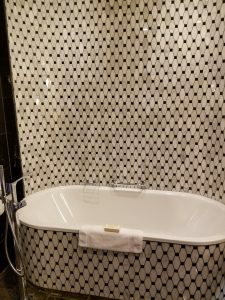 The hotel is beautiful. 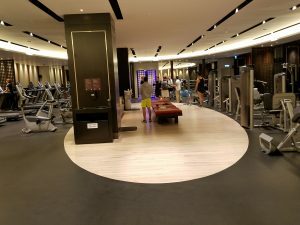 It has a nice spa, indoor and outdoor pools and one of the best Executive Lounges I have seen anywhere both in design and food/drink offerings. 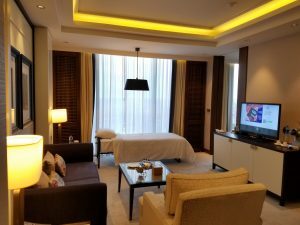 The rooms are large and modern. 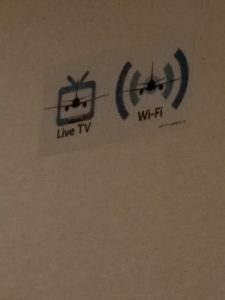 The wifi is great. But its greatest asset are its people-willing to offer you (and guessing when you need) help. 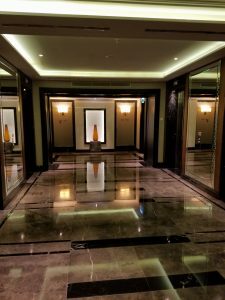 The GM Remco Norden has done a great job in making the Hilton Bomonti one of the best hotels in Istanbul. 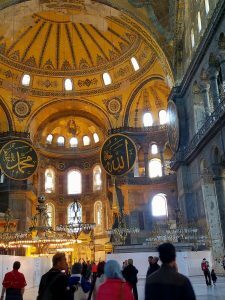 But for me the best part is the welcome and calm embrace it gives you when Istanbul begins to overwhelm you! 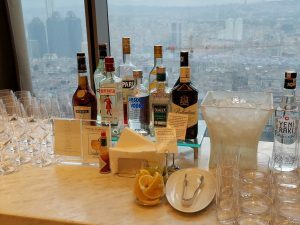 Author gringo10_wpPosted on April 21, 2016 April 24, 2016 Leave a comment on The Hilton Bomonti-a great escape when Istanbul overwhelms you! 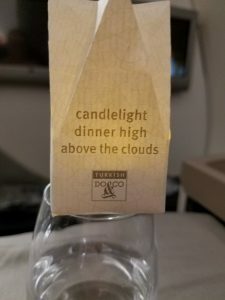 Turkish Airlines = Turkish Delight! 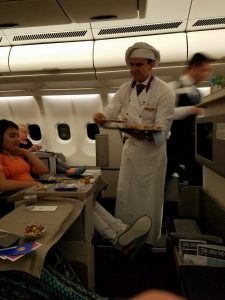 After an uneventful 50 minute flight from Newark to Montreal, I was ready to board the Turkish Airlines Airbus A330 for a 10 hour flight to Istanbul. 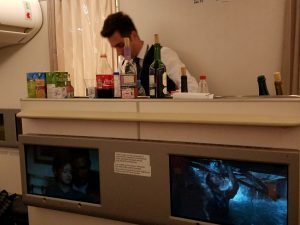 No wonder Turkish Airlines is consistently voted one of the world’s best airlines! 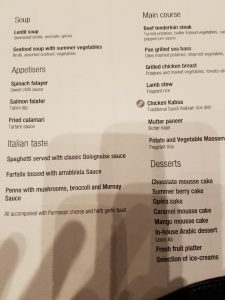 I was seated in business class and the flight had a chef who took your order for dinner (and also breakfast) upon taking your seat. The hard product (plane, seat,food and drink and entertainment system were all excellent) The seat converted into a lie-flat bed. 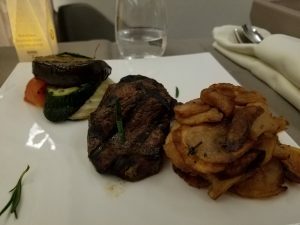 But the best part was the soft product (the flight attendants and chef) who really took pride in their work and went out of their way to show it. 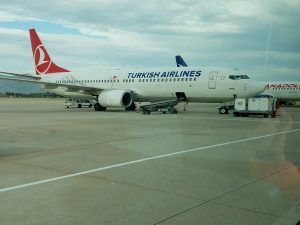 I would not hesitate to fly Turkish Airlines to any destination to which they fly. 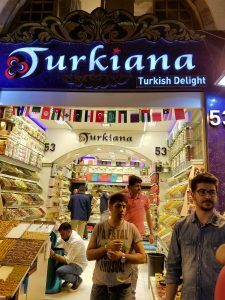 And the surprising thing was that I did not have to wait to arrive in Turkey to have my first Turkish delight! 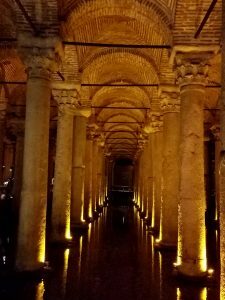 Author gringo10_wpPosted on April 21, 2016 April 24, 2016 Leave a comment on Turkish Airlines = Turkish Delight! 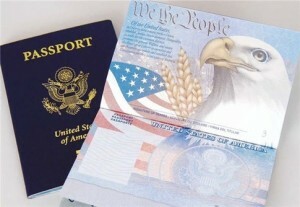 The United States passport-is it the world’s most valuable? To put things in a proper perspective, Afghanistan comes in last with visa free access to only 25 countries (we can all probably guess many of them). And just because a country doesn’t grant United States passport holders visa free access, it is not as bad as it seems. 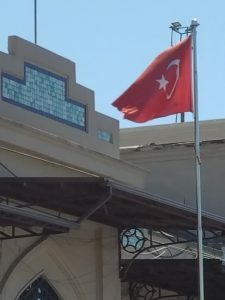 Many of these countries grant “visas on arrival ” at the airport (Dubai and the other UAE), some grant an “e-visa”, which you can pay for and obtain from your smartphone or laptop at any time before entering the country (Turkey and India). 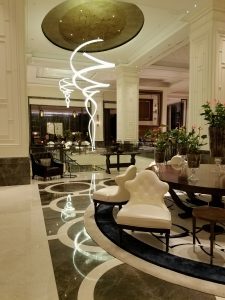 So which countries typically require an American to go through the hassle of applying for a visa through their Consulate or Embassy? Russia, Vietnam, many African countries, China and Brazil, to name a few. But a couple of these also have silver linings as Brazil will grant a visa waiver from June -September 2016 due to the Olympic Games and China has a “72 hour visa free” policy if you stop in certain cities (Beijing) and are continuing on to certain countries (oddly Hong Kong is one). So now you know-the United States is not the world’s strongest passport-it is tied for fourth (with three other countries) and is weaker than 7 other country passports. There are many reasons for countries to require visas: security, revenue, political. 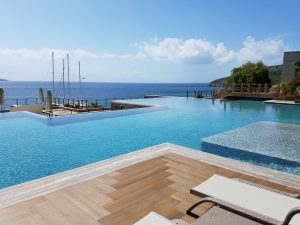 In my opinion, many of the the weaker economies and underdeveloped countries should not require visas -after all, tourism is one of the quickest and easiest ways to generate revenue and at times people will choose to travel to a country with no visa requirement as opposed to going through the hassle, cost and time it takes to get one. What are your thoughts? Author gringo10_wpPosted on March 22, 2016 March 22, 2016 Leave a comment on The United States passport-is it the world’s most valuable? 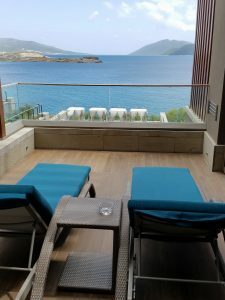 Having been actively “travel hacking” for the past few years, I have learned many things. First and foremost of these is the principle of “earn and burn” aka “your airline frequent flier miles and credit card points will not be worth more tomorrow”. 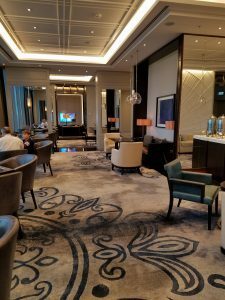 I have also learned that the best way to maximize the value of your points or miles is to redeem them for first and business class international airline tickets at the “saver level”. 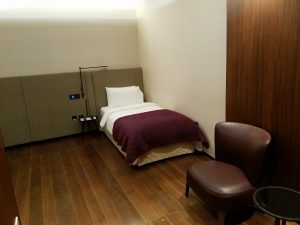 After all, are your 150K miles more valuable when you exchange them for a $500 television set or a $12,000 first class round trip ticket from the USA to Hong Kong? 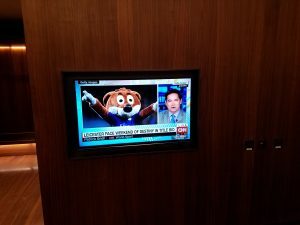 Nothing against the television set for a non-traveler, just not a good value proposition! I will be responsible for filling in the blanks, i.e., getting from Marrakech to Barcelona and any other side trips but my point is this: the above award is a single award redemption, making use of a stopover in Istanbul for as long as I want and my destination as Marrakech. As a result, I am taking 3 trips instead of one, seeing Turkey, Marrakech and Barcelona (Asia, Europe and Africa). My international business class itinerary cost me 140K points plus about $50 in taxes. 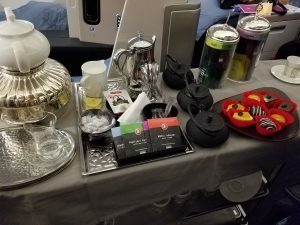 Compare this to a 2 hour flight in domestic (peanuts and a Coke) business class from New York to Chicago at the standard award level- 100k miles and $24. Again-it’s all about the value proposition! Gringo with the lingo- our first post!!! As Nelson Mandela said, “If you talk to a man in a language he understands, that goes to his head. If you talk to him in his language, it goes to his heart.” And according to Saint Augustine, “The world is a book and those who do not travel read only one page.” Languages and travel-the perfect combination. While there are plenty of blogs on either, there are hardly any which focus on both. 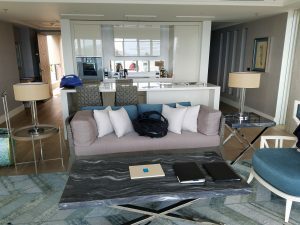 This is the purpose of Gringo with the lingo-to teach you to travel in comfort and style in a smarter, better way while appreciating, learning some words and phrases in, or even studying, the languages of your destination. This will only make your trips much more authentic, worthwhile and rewarding! And just maybe, it will ignite a life-long desire (as it has for me) to make travel and language not only a destination, but a journey. 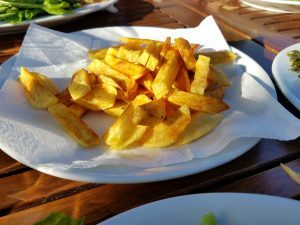 Author gringo10_wpPosted on February 17, 2016 Leave a comment on Gringo with the lingo- our first post!! !